Home | News | The InnoTrans 2018: a complete success ! The InnoTrans 2018: a complete success ! We can look back on a very successful InnoTrans 2018 where we met many of our clients, forged numerous new contacts and held stimulating discussions involving future-oriented ideas and approaches to our business. This positive outcome from the InnoTrans 2018 clearly shows: the track is the future. The InnoTrans is the largest international trade fair for traffic engineering with regard to innovative components, vehicles and systems. As a leading trade fair, it takes places in Berlin every two years. This year 161,157 international trade fair visitors attended the trade visitor days (18. – 21.09.) to find out more about the extensive portfolio of the mobility sector. After four successful trade fair days, the InnoTrans ended for us on 21. September and we can look back on the event as very satisfied exhibitors. 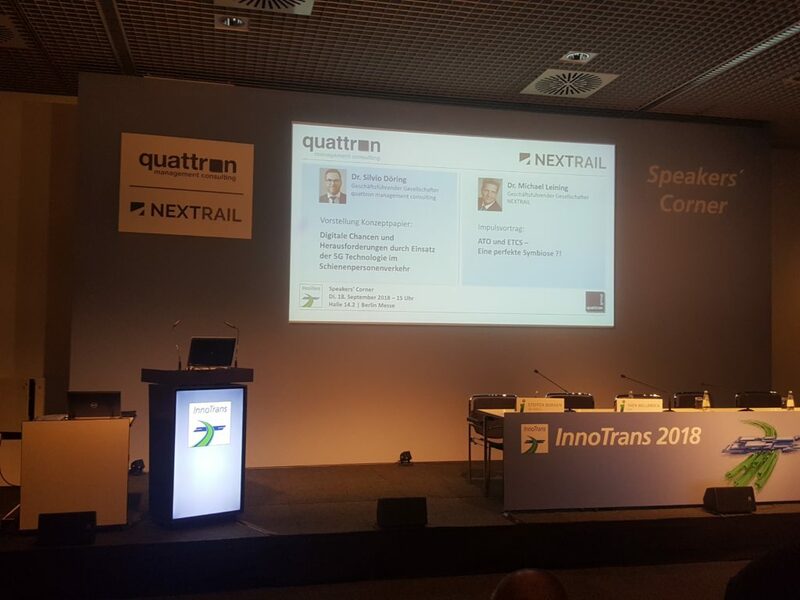 In addition to quattron, the companies NEXTRAIL, vinarIT and q4pm, all members of the quatrron Group, were also present at the community stand of ‘Cluster Bahntechnik der Clusteroffensive Bayern‘ at the packed premises of the Messe Berlin (Berlin Trade Fair Center). 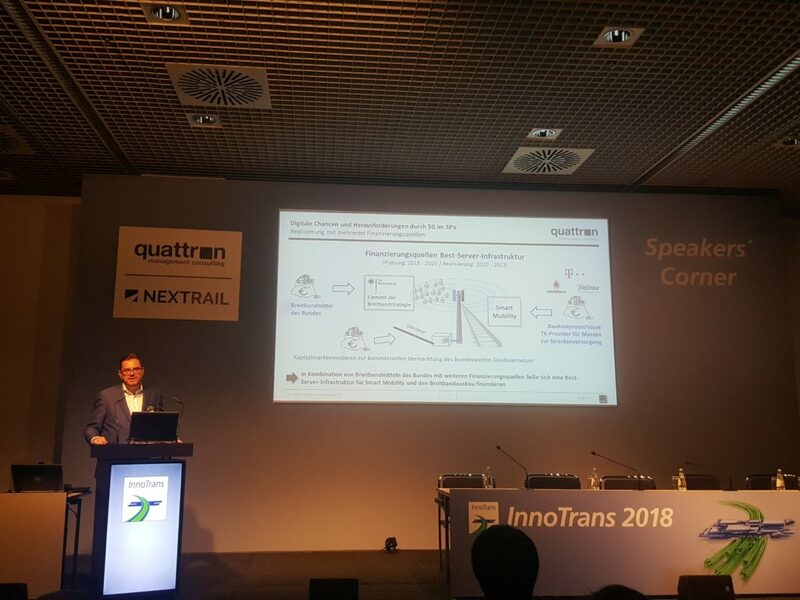 In addition to our portfolio linked to the introduction of new technology and the replacement of outdated technology in the rail sector, quattron also presented the 5G concept paper. As a career point station, quattron was also popular as a contact point for students, graduates and experts with professional experience who were able to find out about attractive career opportunities within companies of the quattron Group. As a result of quattron’s successful stand, the links to co-exhibitors of the community stand as well as visits from our clients, many new contacts were made especially in connection with the issue of 5G and of obsolescence management. 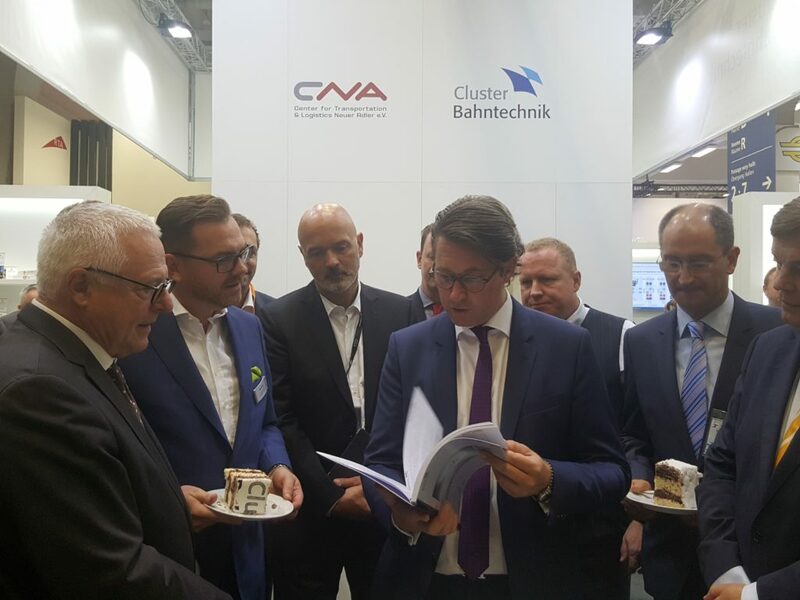 The Federal Minister of Transport, Andreas Scheuer, visited the community stand of ‘Cluster Bahntechnik in Bayern’ on 18. September 2018. After cutting the cake, Dr. Silvio Döring (Managing Director of quattron) handed over the concept paper “Opportunities and Challenges of 5G Technology for Smart Mobility and Smart Rail“ to Minister Scheuer. This paper had been specifically prepared for ‘Cluster Bahntechnik der Cluster Offensive Bayern‘. On the afternoon of the first trade fair day, quattron made use of Speakers‘ Corner to publicize the 5G concept paper*, by means of a presentation by Dr. Silvio Döring. 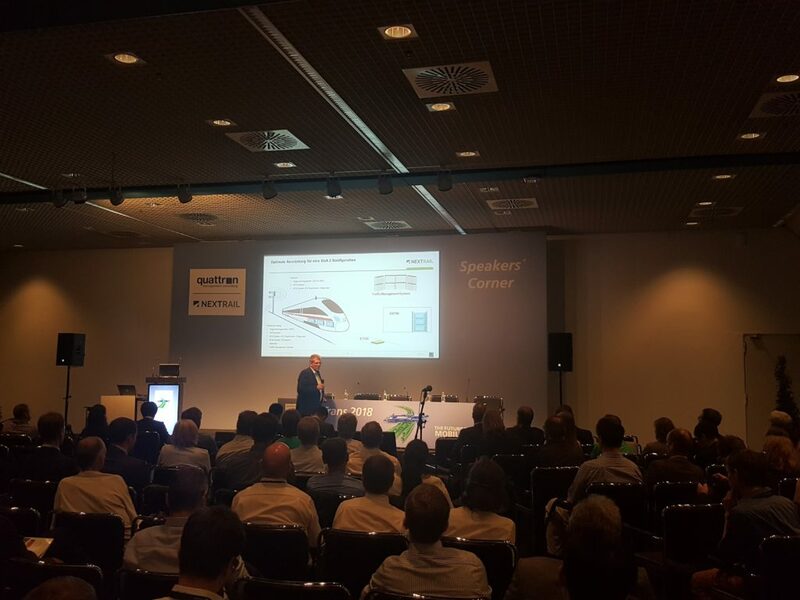 After this successful insight into the 5G study, Dr. Michael Leining (Managing Director of NEXTRAIL) made a presentation on “ETCS and ATO – a symbiosis?“ This ensured that a further future issue became a subject of discussion in competition between the transport modes of track and road. This was followed by an informal networking get-together over coffee and cake. We enjoyed stimulating discussions with experts and many of our clients. 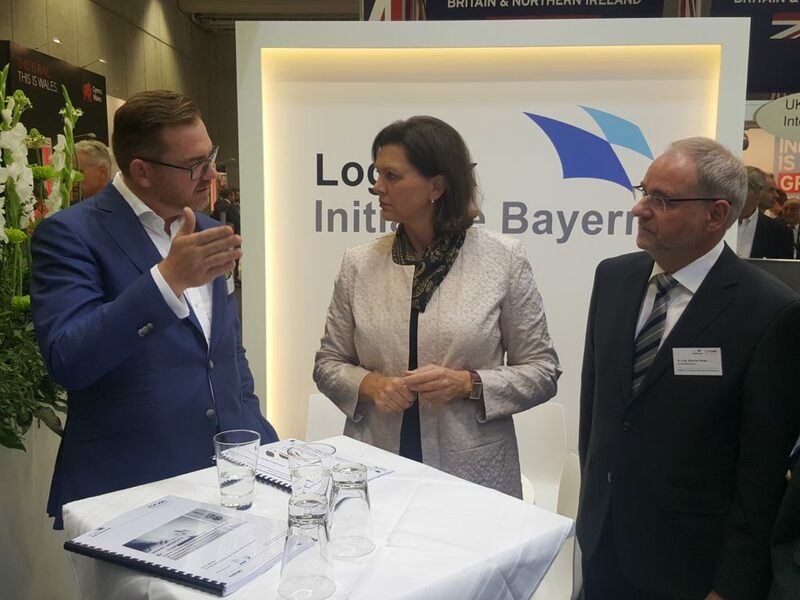 Another highlight at the trade fair involved a visit from the Bavarian Minister of Transport, Ilse Aigner, to the “Bavarian Cluster Morning Get-together” on Wednesday, 19. September 2018. 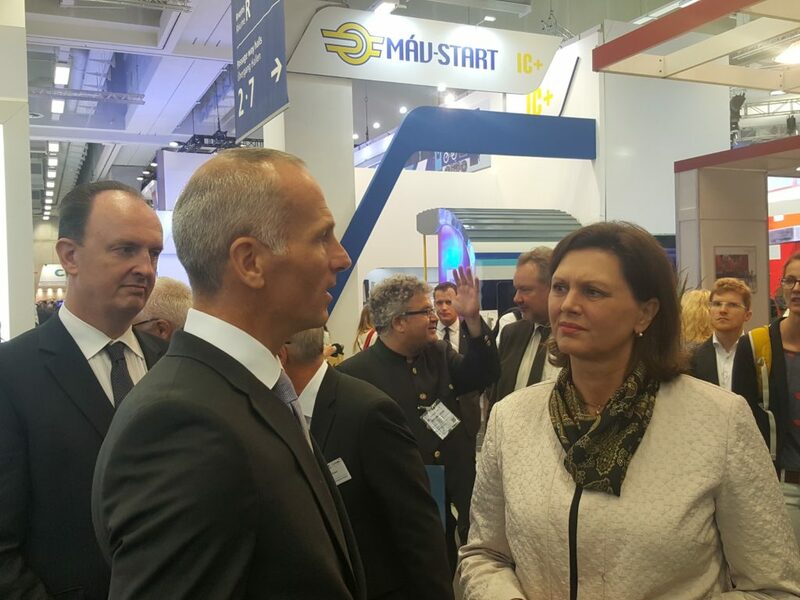 Like our co-exhibitors, Stefan Lossau (Managing Director of quattron) was able to illustrate to the Transport Minister the consultancy services of quattron based on project examples in Bavaria. Dr. Silvio Döring also explained the 5G concept paper to Ilse Aigner in more detail. InnoTrans will take place for the 12th time in September 2020 – we are looking forward to an exciting exchange with you! * Request the concept for free at: 5G [@] quattron.com or on quattron.com.